SINGAPORE - Business receipts of the services industries, excluding wholesale and retail trade, rose 3.3 per cent in the first quarter of this year compared to a year ago, the Department of Statistics Singapore said on Wednesday. Financial and insurance services enjoyed the highest growth in turnover of 9.4 per cent compared to a year ago, followed by health & social services at 5.9 per cent. Information & communications, transport and storage, business services and education services also saw takings rise. But recreation & personal services suffered a 9.9 per cent fall in turnover. 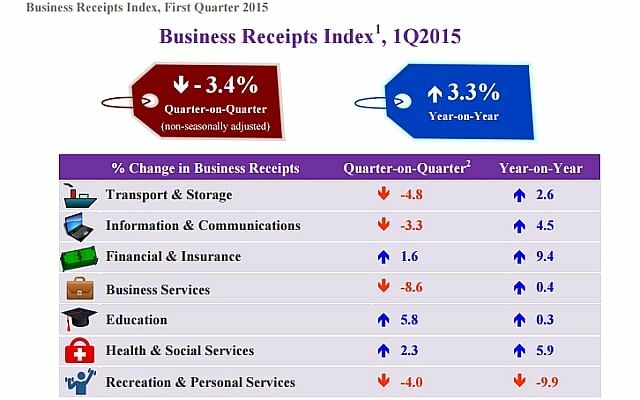 Against the previous quarter, business receipts of services industries declined 3.4 per cent.